JOHNSTOWN – A Chicago firm has been hired by the Fulton County Board of Supervisors to study the feasibility of additional hotel development in the Mohawk Valley county. The lobby of the Holiday Inn of Gloversville/Johnstown, one of Fulton County’s existing hotels. Fulton County officials received five proposals for the study and on August 14 the Board of Supervisors hired Hunden Strategic Partners of Chicago at a cost of $19,500, according to County Planning Director James Mraz. Funding for the agreement comes from a marketing project funded in the 2017 county capital budget. Expanding business and tourist accommodation was one of the priorities voiced during Fulton County’s Vision 2026 Summit last October, in which 90 community leaders, elected officials, business leaders and members of the general public worked together to achieve a vision statement for Fulton County. Hunden is charged with studying data and making site visits to assess the market demand and feasibility of an additional hotel or motel. The unbiased data and conclusions in the final report, expected in 2018, will become tools for local economic development officials to target and promote private development. The target area for the study is an area from the Vail Mills Development Area along the southern and western edges of the Great Sacandaga Lake to the Village of Northville. Below is an excerpt from an in-depth article outlining the virtues of Tryon Technology Park for potential investors in the March 2017 edition of Site Selection magazine. Fifty years after its commissioning in upstate New York’s Fulton County, the 515-acre Tryon Juvenile Detention Center campus in the Town of Perth is experiencing a complete transformation into Tryon Technology Park. It’s just the beginning, says James Mraz, and area native who’s been Fulton County’s Planning Director for 30 years. The facility that was once the jewel of the state’s juvenile detention system was closed in 2011 as part of a system makeover by the State of New York. Its creative, adaptive reuse is a project Mraz calls the jewel of his career, and it is taking place in a county whose entire population is only about 50,000 people. “Many towns and villages are bigger than us,” he says. But no place had a bigger motivation to turn things around. The closure meant the loss of 325 good jobs totalling about $15 million in payroll. See the online edition of Site Selector Magazine here. Tryon article is on digital page 140. In conversations with local leaders, Mraz suggested the closure was an opportunity. After all, the campus already had fiber-optics, natural gas, sewer and water service. It also has a 75,000-sq.-ft. building available for reuse as manufacturing, office or incubator space. The county already had a proven track record in developing three business parks, but by 2011 their available land had dwindled, thanks to projects from companies such as Fage Yogurt, Walmart and Benjamin Moore Paints. Perth also happens to be centrally located in a triangle formed by the GLOBALFOUNDRIES semiconductor manufacturing complex in Malta, the College of Nanoscale Science and Engineering in Albany and the Marcy Nano Center site in Utica. 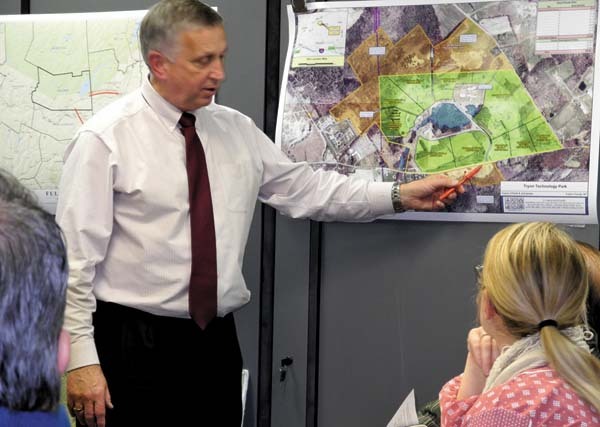 JOHNSTOWN — The Fulton County Industrial Development Agency on Thursday reviewed a proposed 2-megawatt solar array project at the Tryon Technology Park for which county government may be asked to enter into a 20-year deal. IDA Executive Director James Mraz reminded his agency’s board of directors at the Fort Johnstown Annex that the IDA in 2016 hired Latham-based C.T. Male Associates to assess the potential of developing a solar array at Tryon. He said the engineering firm finished that report. “The development of a solar array on a 30-acre parcel seems feasible,” Mraz said. Mraz, also county planning director, said the solar array could be built on a tract of land behind the property of medical marijuana manufacturer Vireo Health. He said that as part of its evaluation, C.T. Male needs to verify if National Grid would allow an interconnection of a solar array into the grid at Tryon. He said C.T. Male has worked with Ameresco Inc. and brought the firm into the project. Mraz said Ameresco has offered to prepare an application for National Grid. “They put together a complicated application,” he said. National Grid said the next step in the project is to prepare an $18,100 supplemental analysis to determine if upgrades would be needed to Tryon substation transformers, ground over voltage protection, or feeder anti-islanding protection. Mraz said Ameresco is “very interested” in getting involved with the Tryon project. He said the firm is proposing to execute a “letter of intent” with the IDA, which owns the Tryon Technology Park property. He said Ameresco would also execute a 20-year land lease with the IDA, and build the 2-megawatt solar array. As an electrical measurement, one megawatt equals one million watts. Mraz said part of the proposal is to execute a 20-year power purchase agreement, or PPA, with Fulton County government in which Ameresco will sell all solar-generated electricity at Tryon to the county. Ameresco will develop, build, operate and maintain the array and obtain all permits. Ameresco will finance the project, which may be partially funded by the New York State Energy Research and Development Authority. Mraz told the IDA board he met last week with the county Board of Supervisors’ Buildings and Grounds-Highway Committee to “introduce” to county supervisors the concept of a possible 20-year county PPA with Ameresco. He said the full board will look at the deal Monday at the County Office Building. Board Chairman Joseph Semione asked if the IDA can go with another company besides Ameresco. Mraz said another approach would be for the IDA to pay the $18,100 supplementary analysis cost and not involve Ameresco. “I kind of like the competitive nature of things,” said board Secretary Joseph Gillis. The IDA board made no decisions Thursday on the solar array project. “This is an evolving thing here,” Mraz said. Fulton County, New York, introduces Tryon Technology Park, a transformative, 515-acre business opportunity in the foothills of the Adirondack Mountains. With Tryon’s state and local expedited approval process, you could be breaking ground on 212-acres of the lowest-priced shovel-ready land in the state in 30 to 60 days, with hundreds of additional acres available for future development. Tryon is located in a pristine, wooded environment… where a company can thrive, take a 180 turn away from a high-cost, high-stress environment. Fulton County’s Targeted Industry Analysis identified seven Industry Clusters for Tryon compatible with existing businesses and the site’s resources: Biomedical R&D, Food & Beverage, Headquarters & Business Services, Health Care Products & Services, Electronics, Renewable Energy and Software & Media. Tryon Technology Park’s first tenant was Vireo Health, which purchased 20 acres in 2015 to manufacture pharmaceuticals from cannabis. In less than a year, it doubled the size of its facility. The origins of Tryon are a unique story of cooperation by state and local governments. When the state closed the Tryon Juvenile Detention Facility in 2011, it was an economic blow to Fulton County. In an effort to turn that negative into a positive, Fulton County officials petitioned the state for control of the property. Two years later, Tryon was deeded over to the Fulton County Industrial Development Agency for redevelopment as a technology park. At the center of the park is the Tryon Regional Business Training and Incubator Center, adding training, classroom, office and workshop space for businesses to utilize. Tryon also has the benefit of being geographically close to its partner in training and workforce development, Fulton-Montgomery Community College. “We continually rely on them for training, customized classes, and working with our people to help further our staff in growth here in the area. Fulton County hosts a vibrant array of biomedical manufacturers, global food processors and light manufacturing companies in three existing business parks. Adding Tryon to that portfolio creates unparalleled advantages for companies searching for an inviting, centrally located home with plug and play infrastructure. Contact us today to find out more about Tryon Technology Park. Fulton County New York – Positive.